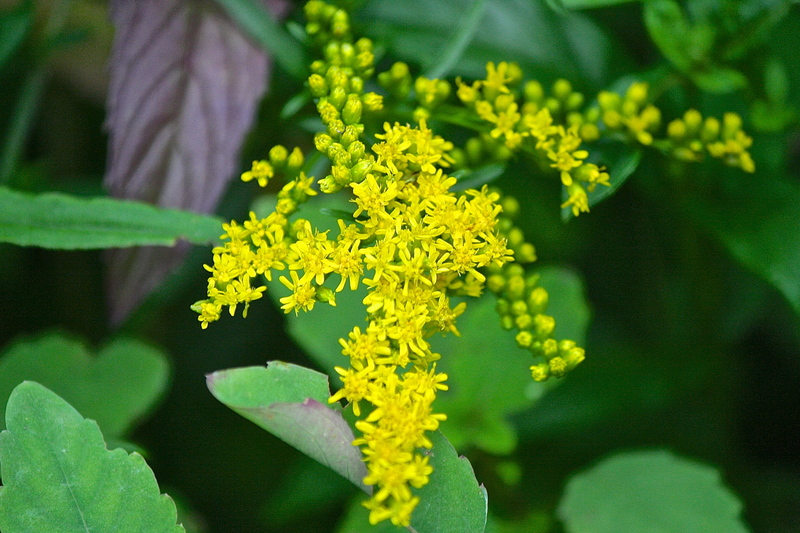 It’s official – I came across the first goldenrod bloom of the year in my spearmint bed on Saturday. In the past, this flower used to fill me with dismay because it signaled the change from waxing to waning summer, on the slippery slope to fall and winter. Granted, this was my perception, backed up by fruit forming and seeds setting. But it was simply an idea. There really is no line, no before or after. Life is a continuum of one day melting into the next in a carousel of seasons, all connected in a long spiral along the ladder of time. So what changed for me? Looking at the bigger picture helped, but it was reading about the plight of bees and how goldenrod is a superfood that comes toward the end of summer. Just in time to give them a big boost to store enough sustenance to get them through the winter. Now I love goldenrod! A whole slew of pollinators from beetles to bees use this plant. I think how wonderful the perfection of nature is, that insects and plants have evolved together symbiotically. 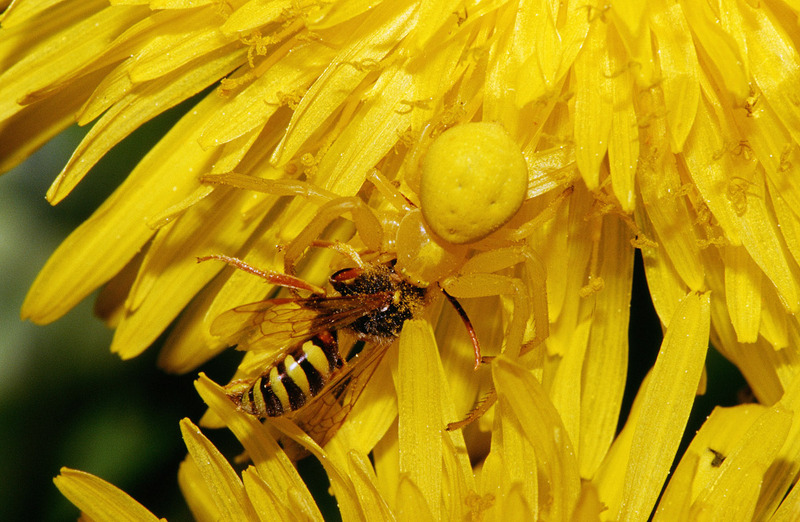 There is even a well-camouflaged, yellow crab spider that preys upon goldenrod visitors. Everything works as it should in nature and learning to trust that balance will be achieved, provided we don’t mess with it too much, is an understanding that I hope the majority of humans will learn very soon before it is too late. Nature has great resilience, but I feel a tipping point is upon us. There is no duality, it is not man vs. nature, we are a part of nature, and the sooner we realize that, the sooner we as a species will start to take care of this planet that is our home. This entry was posted in Field Notes, My Photos and tagged bees, colony collapse disorder, conservation, goldenrod, insects, nature, nature photography, pollinators, spiders. Bookmark the permalink. Balance is so important. Love the bright yellow! On your last photo, I saw the bee and then the description beneath about the spider. I was confused. Another thoughtful mediation and beautiful photos to thank you for, Eliza! My first memories of the word was from long ago in grade school, where there were different colored papers, and one of the colors was “goldenrod”. I always thought that it was a wonderful name for a color. I didn’t even know there was a flowering plant with the same name. Not sure, but I don’t think there was any goldenrod growing in Phoenix, where I was a child. There are desert versions of goldenrod, even one S. californica, see here for more info: http://southwestherbs.freeservers.com/gold.html . I have several species on my land and Solidago is quite rampant a grower, one of the first plants to colonize a disturbed landscape. It can take over a place quickly, thus my previous dislike, but now I let it rip and boy is it ever! I am going to have to visit a garden center to fix this plant in my mind’s eye. I must have seen it & not known what I was seeing. Thanks for the link. It looks like there are lots of uses for it. it is amazing how some information can change our understanding and our perceptions/feelings. 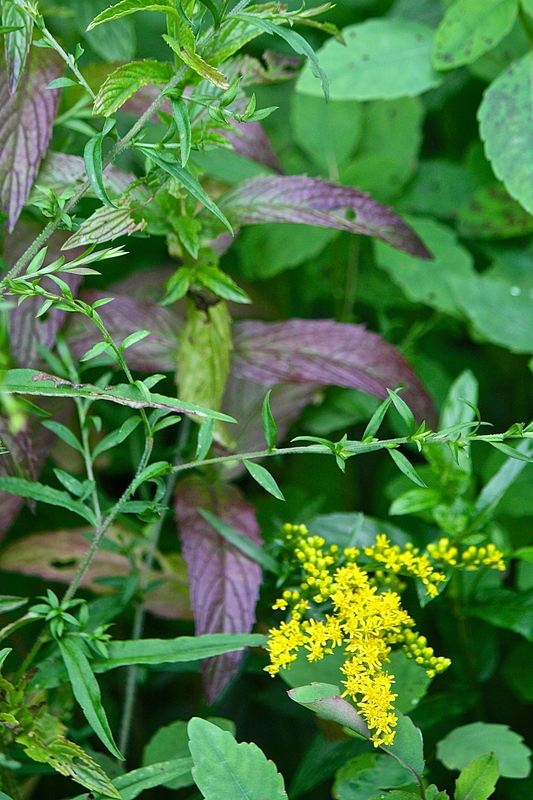 Knowing that goldenrod is a “superfood” for bees puts it in a different perspective . Where before we saw the end of summer, now we see the gift. The goldenrod is Nebraska’s state flower! I have never seen a spiker like that. Yikes! I have goldenrod in my garden but it is going to be a while before it blooms. That one was the first and a bit earlier than the rest, which will come along in early August. If that is your state flower, you must have lots of them! They are quite pretty. I have a species that looks like fireworks – it’s my favorite. You are always “spot on” Eliza!!!! I got your seeds the other day, too exciting!!! I will be doing a post in the future about those seeds + you, but have to grow them out-tee hee! Climate change is a complex thing, hard to pin down, but the extreme weather patterns most likely will continue as the earth shifts and adjusts (always balancing). It is simple physics, the earth responds to cause with effects. Human activity (7 billion & rising) has a measurable impact that affects the earth, adding to changes in plate tectonics, polarity, etc. We might not like the whiplash! Glad you got your seeds, hope they grow well! I just found your blog via ‘Silver in the Barn’ and it’s lovely. Your photography is outstanding! And I couldn’t agree with you more, Goldenrod has always heralded the beginning of the end in my mind, but I love that it’s a giant wave of sustenance for insect life. Thanks, Caroline for your visit and kind words. Do come again! I will. You have a great site! Yes, summer does feel quite short up here, really only about 3 mos. are warm enough to earn the title summer, J-J-A. But May and Sept, though cool, have a few warm days, and are my favorite mos. It is the rapid pace that gets me, where do those days fly off to? I try to stay present and drink in as much as I can.